I received a call from Mark and Rachel, property managers of the All Star Value Inn in the Wisconsin Dells. Rachel explained the night before, her husband had been playing volleyball with friends and lost his wedding ring. The volleyball court had been recently redone (raked and new sand added). The court was actually located on site at the All Star Value Inn, which was good because it meant the traffic should be minimal. Mark did not remember his ring specifically flying off, but he did remember having it on throughout the match. Rachel said that he even thought to himself, “I should probably take off my ring so that I don’t lose it”. Famous last words, right? Seconds later, while about to serve, Mark felt two of his fingers rug together and there was no ring on his finger. Lost Ring found Wisconsin Dells? The good news is that he knew where he lost his ring, but how would they find it? Mark had plans to rent a metal detector and find it himself. However, he would have found out that operating a metal detector isn’t as easy as it might sound. Rachel thought she should have a back up plan, so she went on Google and searched for “Rent a Metal Detector”. 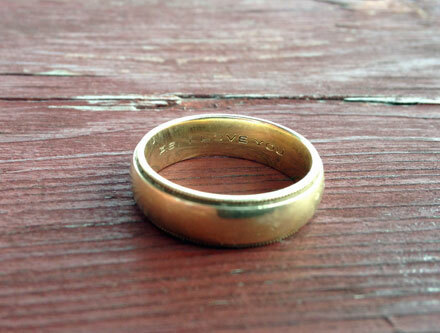 One of the pages she found was our Lost Ring Recovery and Metal Detecting Service website. 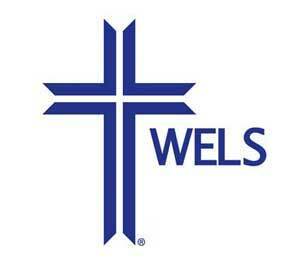 She found that there was someone who was willing to travel to the Wisconsin Dells area. I try my best to go on almost every hunt I get a call for, even those that are outside of the Madison area. However, there are times when my busy life with two kids and a wife doesn’t allow that to happen. This day, we just happened to be available – it was essentially the “last week of summer” for us before school started in full swing. The kids had actually started already, but only one or two days … so we were clinging to summer as much as we could! She sent a quick email to me, and I immediately responded and set up an appointment the next day to take a look. When I arrived, Mark and Rachel were having a friends and family picnic right next to the volleyball court. My son and daughter were along for the hunt as usual. 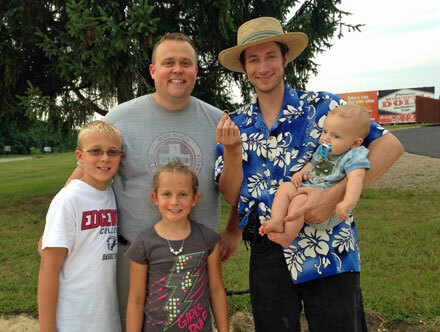 I started the hobby of metal detecting and lost ring finding as a way to spend time outdoors with my kids. They love the hobby, and love helping others find what was once lost. My daughter asked if she could do this hunt by herself. I’m one to always promote an independent girl (really don’t have a choice in the matter – she is independent and that’s about it) – plus this should be an easier hunt given it was in a sand volleyball court. She first found 4-5 pieces of trash: a pop top, a Matchbox Car, some small metal objects, and a nail (good thing we removed the nail – wouldn’t want that in your foot when jumping for a spike!). All of a sudden she got a strong signal from the metal detector, which is usually a good sign. My daughter reached down, grabbed a fist full of sand and pulled out Mark’s ring! We walked over to the picnic table and handed the lost ring back to Mark. Everyone was surprised that we had found the lost ring, and so quickly. Mark’s ring had a unique inscription on the inside, “P.S. I Love You”, so there was no question it was his. 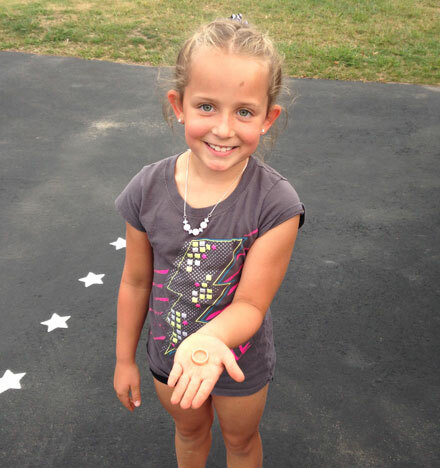 My daughter was probably the most excited, as it was her first lost wedding ring recovered all by herself … no real help from her dad or her older brother. Check out that smile! Mark and Rachel were generous with their reward for finding the lost ring. They then asked if we had eaten anything that night. I responded no, and that we had to head back home as my kids had started school already. She asked if we had ever eaten at the High Rock Cafe on the strip in Wisconsin Dells, which was their favorite place to eat. We had never been there, so she called the restaurant and opened a tab with our name on it. She said, “Order whatever you guys want and put it on our tab”. What a cool reward. We felt like celebrities when we walked in. The manager of the restaurant practically greeted us at the door, “You must be the people who found that lost ring”. We responded yes, and he showed us to our seats. After a nice dinner, the kids and I headed back home.